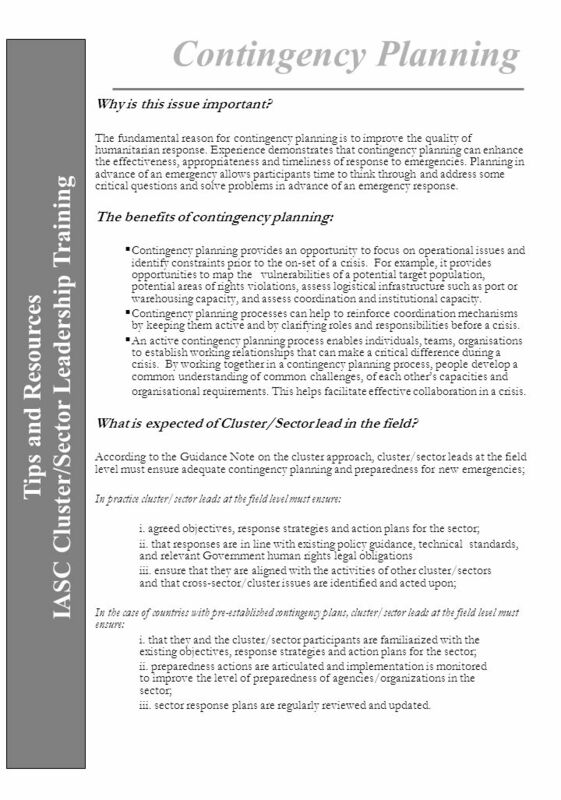 Contingency Planning Prioritize and implement preparedness actions. Contingency Planning should not be a theoretical exercise; its main objective is to ensure that agencies/organizations develop a level of preparedness that is sufficient to respond to an anticipated emergency. Prioritizing and implementing preparedness actions, and monitoring agreed early warning indicators for developments that would trigger response, convert intentions into action. Co-ordinate with government and other partners as required on measures required to enhance preparedness and response capacity; Review and update the plan on a regular basis. The contingency planning process does not end with the production of a plan. The process must be continued and plans reviewed and updated on a regular basis. It is particularly important that the plan be thoroughly reviewed when there is a change in the situation or a change in the institutional environment such as a significant change in membership or leadership of the cluster/sector. Draw upon experienced staff from agencies/organization at the regional and global level as well as Global Cluster Leads for the necessary technical support required for contingency planning activities; Conduct regular tests/simulations of the plan. Testing/simulation exercises are valuable in familiarizing those who will be involved in response with the coordination and response mechanism envisaged in the plan. They also help to test planning assumptions and response systems. 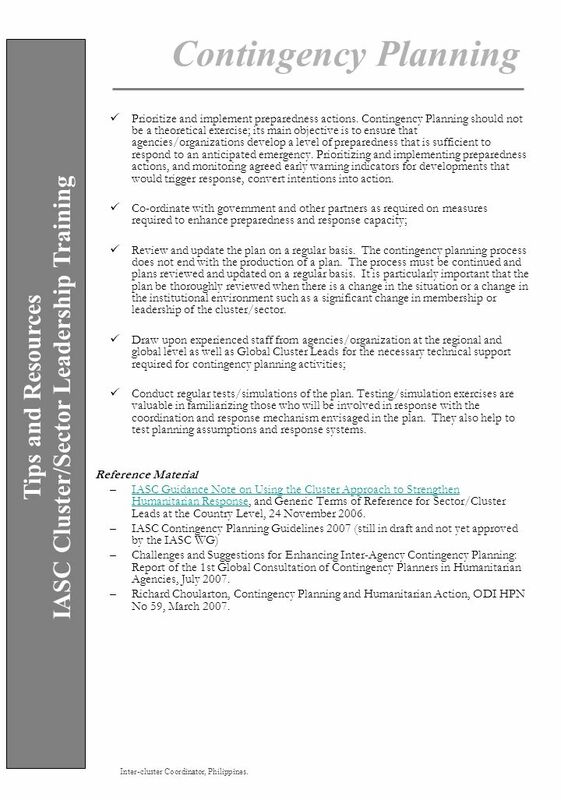 Reference Material IASC Guidance Note on Using the Cluster Approach to Strengthen Humanitarian Response, and Generic Terms of Reference for Sector/Cluster Leads at the Country Level, 24 November 2006. 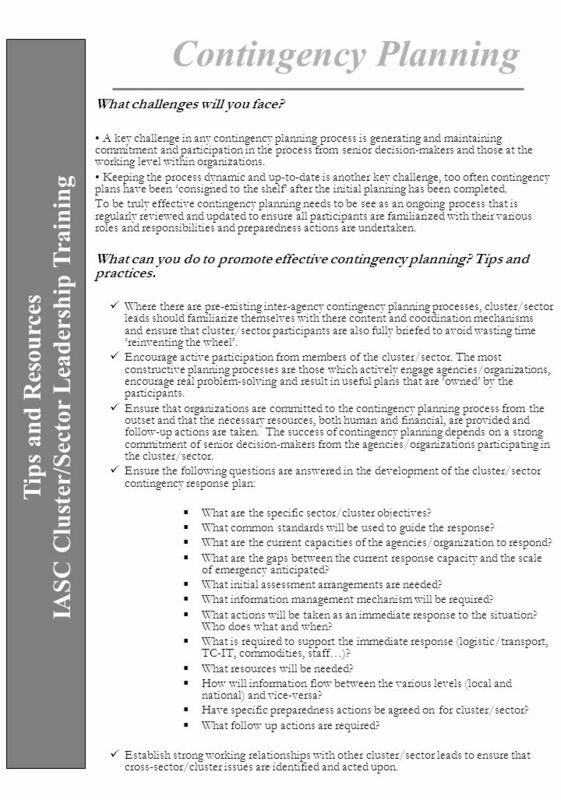 IASC Contingency Planning Guidelines 2007 (still in draft and not yet approved by the IASC WG) Challenges and Suggestions for Enhancing Inter-Agency Contingency Planning: Report of the 1st Global Consultation of Contingency Planners in Humanitarian Agencies, July 2007. Richard Choularton, Contingency Planning and Humanitarian Action, ODI HPN No 59, March 2007. Tips and Resources IASC Cluster/Sector Leadership Training Inter-cluster Coordinator, Philippines. Download ppt "Tips and Resources IASC Cluster/Sector Leadership Training"
Hazard and Risk Analysis What are the socio-economic and political trends? Consider recent assessment / reviews / baseline studies / analytical exercises. Workshop B NGOs and the Cluster Roll-Out Strengths and Suggestions for the Future. Humanitarian to Recovery Transitioning out of Humanitarian Coordination. OCHA UGANDA TESO FLOODS LESSONS LEARNT July-December 2007. GBV Guidelines on Coordination Stresses the multi-sectoral approach Promotes establishment of inter- agency and multi-sector working groups Provide important. GWC IM Diagnosis Presentation for Global Clusters Date: 12 Feb 2013 Team: MM & PvM Content of the presentation Objectives Methodology Expectations Main. © Grant Thornton UK LLP. All rights reserved. Review of Partnership Working: Follow Up Review Vale of Glamorgan Council Final Report- November 2009. A REVIEW OF THE HUMANITARIAN COUNTRY TEAM (HCT) IN NIGERIA & RECOMMENDATION FOR WAY FORWARD Presented at the HCT 05/06/2014. COORDINATED ASSESSMENTS: FROM POLICY TO PRACTICE June 2012. Nutrition Cluster - South Sudan Nutrition Cluster Performance Monitoring Review Workshop Findings 4 th April 2014 ARON HOTEL.